There are various major holidays celebrated across the calendar. During those times of year, senior living communities are typically bustling with activity as families and friends come to visit bringing gifts and tasty treats. During the down-times, though, you can provide some fun and entertainment. Do so by helping a senior living community celebrate a less popular holiday. Consider Groundhog Day, National Pizza Day or Darwin Day. Or, look into health-related occasions. For example, April is Parkinson’s Awareness Month. During the month consider hosting various gatherings to inform people about the disease and have a speaker come talk about his or her experiences with the condition. Many senior living communities host nights where residents can enjoy cards and other games. 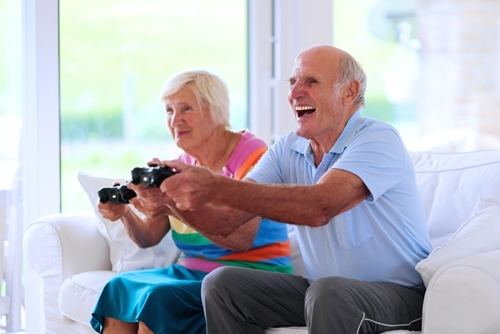 You can liven up the occasion by bringing in new games the seniors haven’t played before. Consider teaching everyone how to play Spite and Malice, Apples to Apples or mah jongg. Talk to the community staff to learn what games they frequently play and take a poll to see what the residents may want to learn. You can even have the seniors teach you a thing or two about the games they love! Staying updated: Today’s technology needs to be updated every few weeks or months. Many seniors don’t keep up with those little notifications and may find their tech devices aren’t working properly. Help them address this issue with some tips and tricks! FAQ: Not every senior has a grandkid or adult child to assist them with learning new technology. This can lead to plenty of unanswered questions. You can offer to help with everything from email etiquette to how to follow someone on social media. The community residents will appreciate your time and effort as well as their new-found tech knowledge!